Shortly after the end of the First World War, the British organized a special commission to investigate and recommend methods of defending against attacking aircraft, the Imperial Defense Committee on Anti-aircraft Defense. In 1926 this Committee issued a report which stated that accurate bombing of ships was possible only if the attacking aircraft flew straight and level at a constant speed and suggested the most likely heights and speeds that would be used. This viewpoint was further strengthened by joint conferences between the RAF and the RN in the late 1920s, where the RAF downplayed the capabilities of dive-bomber aircraft and repeated the warnings about the dangers represented by level bombing. This Committee's major conclusion in regards to destroyers was that high level bombers would only be passing the destroyers on their way to strike at capital ships and that they would not be attacking the destroyers directly. An analysis in this report showed that attacking aircraft flying at a height of 5,000 feet and at a distance of 5,000 yards (1,525 m and 4,570 m) would only be 18 degrees above the horizon. For that reason, the Committee concluded that 'future destroyers should not be fitted with a dual purpose armament' and recommended a maximum main gunnery elevation of only 40 degrees.2Furthermore, the committee strongly recommended that long range gunnery should 'take precedence over . . . close range defence' as it was felt that close range defenses were only of use to the individual ship and were thus 'impotent against high [level] bombing aircraft' attacking the fleet as a whole.3 These conclusions led to all British destroyers built in the 1930s being equipped with LA (low angle or single purpose) main guns and in having few close-range automatic weapons for defending themselves against aircraft. Finally, a predictive or "tachymetric" anti-aircraft control system was ruled out as it was considered to be too costly to implement.4 This was three years after the United States had sent to sea just such a system, the Mark 19 director, which was the direct ancestor to the very successful Mark 37 Gunfire Control System (GFCS) which was used on almost all US warships destroyer-sized and larger (along with several auxiliary vessels) built in the late 1930s and 1940s. HACS continued to evolve through to the outbreak of the war, with the HACS Mark IV being the latest in service in 1939. In this and all earlier versions, the HACS calculated the required 'aim-off' with the assumption that the target's height, speed and course were constant and that the target's speed had been correctly estimated. As can be easily seen, this design concept falls apart for any other kind of air attack except for high-level bombing. In addition, the inherent lag-times built into the system meant that it was too slow to deal with the higher-speed aircraft that started coming into service late in the 1930s. Almost all destroyers with 4.7-inch guns had the HE time fuzes set by hand. This affected the firing solution not only by the time setting itself, but also in that the fuze setter became the critical time factor. No matter how fast the guns could fire or how quickly ammunition could be supplied to the mountings, even a well-trained fuze setter needed about 4 to 5 seconds to handle the round and set the fuze properly. Faster speeds invariably resulted in improper fuze settings and loss of effectiveness. These factors encouraged the use of barrage firing as it meant that all fuzes were set the same, thus requiring less time by the manual fuze setters.11 Most larger ships used fuze setting machines, but all of these could only handle one round per barrel at a time, thus slowing the practical rate of fire. An interesting but unfortunate side effect of these fuze setting systems was that the "dead time" between the point that the shell left the fuze setting machine and the point it was fired out the gun needed to be calculated based upon the slowest gun crew on the ship. As the guns were fired by remote control, this effectively meant that all salvos had but a single time setting. Again, this slowed the practical rate of fire. 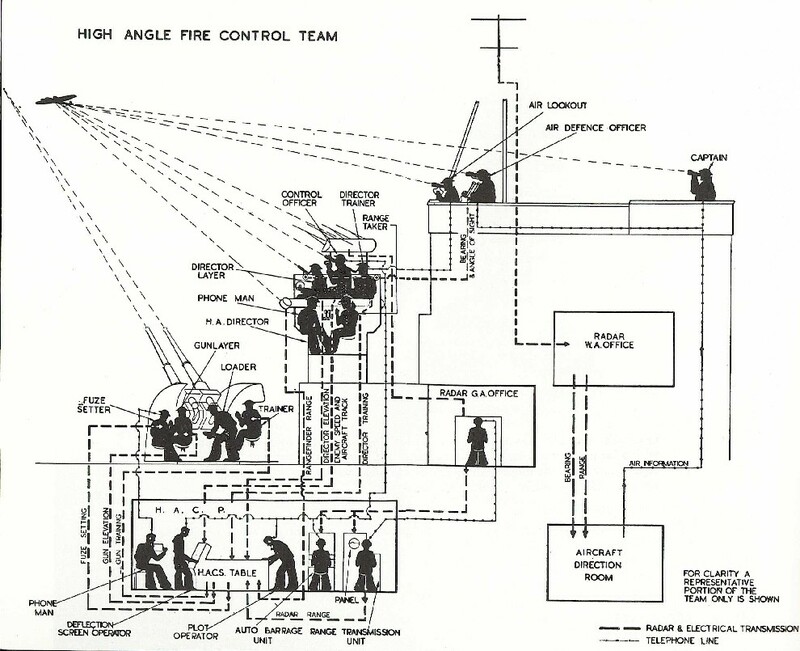 Anti-aircraft fire control during the World War Two period required a large crew of highly trained individuals and specialized equipment (see Figure 1). The target's future position was determined by the Deflection Screen (see Figure 4). The Deflection Screen projected an image of a ring with an arrow-type pointer at the center of the screen. The pointer represented the future position of the aircraft and the ring represented the present position. The direction that the arrow was pointing at represented the target's course. The ring was tilted by a drive from the future angle of sight and the image on the screen gave an ellipse of the required shape. The size of the ellipse was adjusted by moving the projection unit by an amount calculated by dividing the target's speed by the average of projectile velocity. With the present position on the circumference of the ellipse and the future position at the center, the vertical and lateral deflections were given by the distance of the present position from the center, measured parallel to the ellipse axes. The screen operator continually moved a pair of wires, which were perpendicular to each other, such that the intersection of the wires was also the intersection of the pointer and the ellipse. This information, together with corrections for the ship's own movement, convergence and drift, were fed to the table which was then able to calculate the azimuth of the guns. The table computed the ballistic height as a function of the muzzle velocity, projectile shape, air temperature and density. Wind correction was only via the control officer offsetting the graticule in his binoculars. The ballistic height was translated into a fuze-setting for the AA shells. The settings of the clockwork time fuze worked in the following sequence: Future range, height, time of flight, set-back correction, fuze number. Future range was found by plotting preset range against time plus a dead time addition to allow for the transmission of the information to the guns. The fuze-setting was transmitted continuously to the fuze-setter station next to the AA guns. Via a rate unit, the table would continue to estimate the future position of the target and continued to generate a plot if the height finder failed or if the target was temporarily obscured by clouds or smoke. As can be seen from the above description, the control officer's skill in correctly estimating the target's speed and the wind direction and speed were crucial to the successful engagement of an aircraft. These problems were somewhat alleviated by the addition of the Type 285 radar set. This radar could more accurately determine range, speed and course of the target aircraft then could the control officer and was thus able to provide more accurate data to the table. However, the HACS Table was still really only able to calculate firing solutions for targets that maintained a steady course, height and speed; in other words, it was most useful for the least successful type of attacks that took place during the Second World War. The HACS Mark I was installed onto most newer capital ships by 1935. The original Table for this system had a maximum target speed input of 200 knots. Modifications had raised this to about 250 knots by 1940 and plans were in place at this time to raise the maximum speed still further to 350 knots and to fit gyro roll correctors. The HACS Mark II was similar in design to the Mark I Table with some minor improvements and was used on the Leander class cruisers and the battlecruiser Repulse. Modifications similar to those for the Mark I were carried out on about the same time frame. The HACS Mark III Table was installed to those cruisers built in the period between 1925 and 1935 and to some older battleships and carriers. 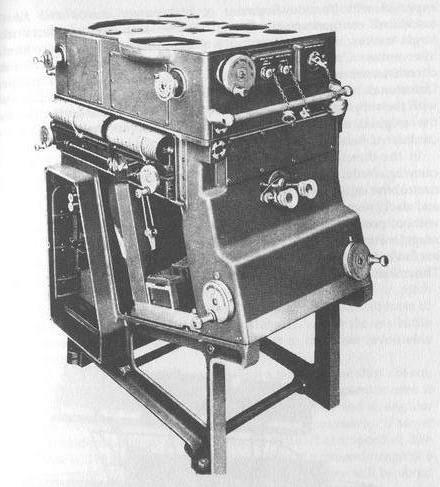 This Table was a considerable improvement over the earlier Marks as it was easier to maintain and was equipped with hydraulic power and transmission systems for director training and elevation along with gyro roll-correctors. During the war, roll compensation was added to the directors. The HACS Mark IV was installed on "Town" and succeeding cruisers, the first four units of the King George V class battleships and to new aircraft carriers. Similar to the Mark III, but with magslip data transmitters in place of stepper motors. Roll compensation was provided but cross-roll compensation was not added until sometime later. HACS Mark IV* was a modification to allow easier inputting of radar information. Ships with 5.25-inch guns had special modifications to accommodate the slower rate of fire of these guns when compared to smaller calibers. 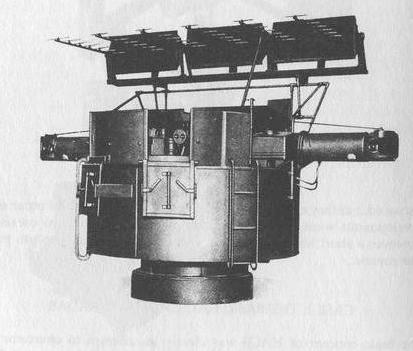 Figure 3: HACS Mark III Director after having radar added. The Mark I through Mark III directors were similar in principle to the Mark IV director but they were solely hand-trained. The Mark I was designed so as to fit nicely into the existing High Angle Control Positions (HACP) already present on the Queen Elizabeth and Royal Sovereign classes.21 Mark II had some provisions to allow the fitting of power drives, but these were not actually fitted until much later. The major difference between Marks I/II and the Mark III was the increase in rangefinder baselength from 12 feet to 15 feet (3.7 m to 4.6m), this larger length being continued in the Mark IV. Like most RN rangefinders, these were coincident types. It should be noted that coincident rangefinders have some difficulty with aircraft targets compared to stereoscopic rangefinders, as the coincident type of rangefinder depends upon matching the edges of two views of the target to make a "cut," which is difficult to perform on a fast moving aircraft. The Mark III was designed to use hydraulic power for training and elevation, but not all of these units had drives as built. Mark III* added a roll correction hydraulic drive. 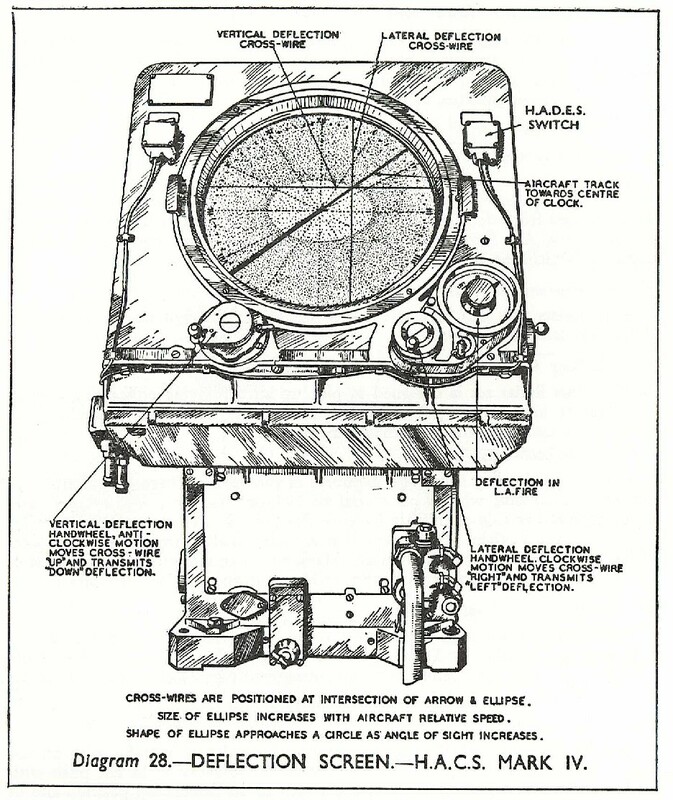 Mark III directors had radar added during the war as shown in Figure 3. The Mark 4 HA/LA was the last pre-war version and was similar to the Mark III* but used magslips to control elevation, training and roll correction. Some units had local power control for training and elevation. With the addition of the GRU, directors were reclassified as Mark IVG, and with the further addition of hydraulic cross-level stabilization they were reclassified as Mark IV(GB)HA. The 'B' modification allowed remote power control of the director from the Table when in a blind-fire mode. As noted above, most Mark IV directors had a radar antenna added during the war, usually Type 285. The weight of this installation caused some problems, as it could overload the drive units. With the Type 285 radar, these directors weighed about 5.5 tons (5.6 metric tons). Most Mark IV directors had been upgraded to the Mark IVGB standard by the end of the war. 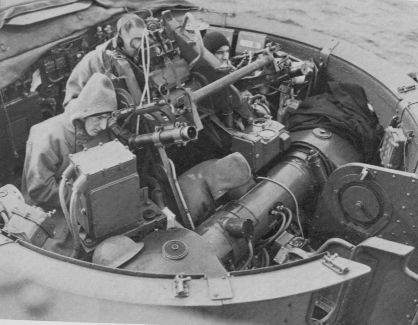 The Mark V director series differed only in the position of the range finder and were intended to give less cramped arrangements for the director crew. They also benefited from being designed from the start to accept radar, thus alleviating the problems encountered with retrofitting the Mark IV. See Figure 1 for crew positions and general layout. 437. He is the captain of the team and on him rests the responsibility of seeing that no enemy aircraft approaches without being engaged. He chooses the targets to be engaged from the air defense position at the rear end of the bridge and by means of the Air Defense Officer's Sight, indicates the approaching enemy aircraft to whichever H.A. director he wishes. (ii) The Assistant Air Defense Officer. 438. Assists the A.D.O. and operates the A.D.O. 's sight on the other side of the air defense position. 439. This Radar set is designed to pick up aircraft flying either singly or in formation at long ranges. The information that it receives is passed to the Action Information Centre, and thence to the A.D.O. 440. These are very important members of the team. There are six air lookouts, three each side, who sit on special air lookout seats, fitted with binoculars, in positions either side of the Air Defense Position. Each lookout has an arc for which he is responsible. He sweeps that arc continually through his binoculars reporting as soon as he sees an aircraft. Having seen an aircraft he must keep it in his binoculars, until he receives further orders from the Air Defense Officer. (v) The High Angle Control Officer. 441. He sits in the high angle director and having been put on to the aircraft to be engaged, by the Air Defense Officer, he gives the necessary orders to the calculating position for opening fire and subsequently spots the bursts on to the enemy aircraft. (vi) The High Angle Director's Crew. 442. Consists first of all of the director layer and trainer, who keep on the enemy aircraft continually, the layer operating the angle of sight cut push with his foot as soon as he is on. This burns a light in the calculating position and in the air defense position and tells these positions that he is "ON" the enemy aircraft. The director layer also fires the guns electrically, by means of a trigger, during the time that the fire buzzer is ringing. The other member of the crew is the rangetaker. He gets a "cut" as soon as the director layer and trainer are on and subsequently throws off and re-cuts continually, so as to get as accurate readings as possible. (vii) The Radar Ranging Set Operators. 443. The aerials of this set are mounted on the director and are moved when the director is laid and trained on to the target. Thus they are pointed continually at the enemy and Radar ranges are passed to the H.A.C.S. Plot, from the Radar Ranging panel operator. (viii) The Crew in the High Angle Calculating Position. 444. The operators of the H.A. table are given the estimated course and speed of the aircraft by the Control Officer and from this information, together with the measured range and movements of the director as it follows the target, are calculated the gun elevation, training and fuze number. These are passed continually to the guns. The H.A. table also sounds the fire buzzer automatically at regular intervals. This tells the director layer when to fire. (ix) The High Angle Guns' Crews. 445. The gunlayers and trainers must follow the movement of electrical pointers in the elevation and training receivers. It is also extremely important that the correct sequence of setting fuzes and loading the fuzed shell into the guns is carried out by the guns' crews, because each shell carries a fuze that is only correct for that particular moment. These points must never be sacrificed to achieve a higher rate of fire. Figure 4: The HACS Mark IV Deflection Screen. Sketch from B.R. 224/45. 425. In Diagram 28 [Figure 4] will be seen a picture showing the deflection screen of a Mark IV table. An optical system inside the table throws on to the screen the image of a circle, which is engraved on a plate. This circle can be tilted by a mechanism, according to the angle of sight and will thus show on the screen as an ellipse, whose shape will vary according to the angle of sight. The optical unit inside the table is moved according to [u / a.p.v.] so that any variations in these will show on the screen as changes in the sine of the ellipse. The track of an aircraft is also shown on the deflection screen by means of a wire, which is pivoted at the centre and rotated in agreement with an arrow in the Control Officer's binocular. The Control Officer, in the H.A. director, keeps this arrow along the fuselage of the aircraft and thus the correct track is sent down to the deflection screen. 426. The deflection screen operator sits facing the screen, looking at the ellipse. He has two handwheels, one either side of the screen, marked Vertical Deflection and Lateral Deflection. These are connected to wires, which can be moved across the face of the screen. The duty of the deflection screen operator is to keep these deflection wires over the intersection of the wire marking the track of the aircraft and the ellipse. By moving the deflection wires from the centre of the ellipse to the point of intersection, the deflection screen operator measures the vertical and lateral deflection of the aircraft and sends these away to the red pointers at the elevation and training receivers at the high angle guns and so gives the guns the necessary "aim-off," both for elevation and training. 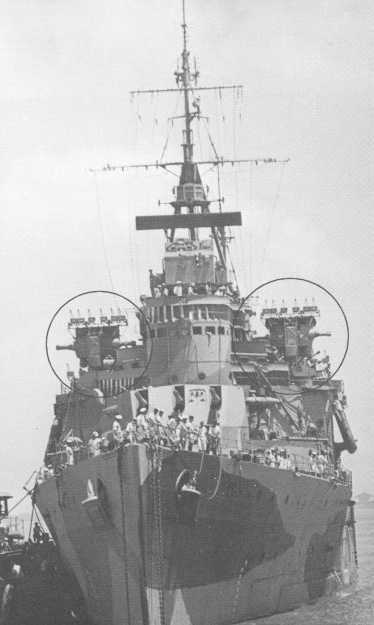 Figure 5: HACS Mark IV Directors with Type 285 Radars. HMS Nigeria in June 1943. The radar antennas are known as "Yagi" (Fishbone) arrays. USN Photograph. Figure 6: Fuze Keeping Clock (FKC) Mark 3. Note the lack of the plotter. HMS Collingwood. No analysis of HACS would be complete without a brief mention of the contemporary USA's Mark 37 Gunfire Control System (GFCS), some of which were also supplied to the Royal Navy. In British terms, these were "HA/LA" systems, that is, they were intended for use against both aircraft and surface targets. This system was first introduced into service on the destroyer USS Sims (DD-409) in early 1940 and was quickly adopted for all new US warship construction of destroyer size and larger. Some auxiliaries built pre-war were also equipped with this unit. The Mark 37 GFCS differed from previous US directors by having the analog computer and stable vertical mounted below decks in order to reduce the size and weight of the director itself. An important feature of this system was that AA time fuzes were automatically - and continuously - set in the shell hoists, which not only eliminated a source of human error, but also meant that the rate of fire was not affected by the skill and speed of a human fuze setter, thus allowing faster firing cycles. This feature allowed ships to fire whatever barrels were ready at any given time, again resulting in an appreciably faster rate of fire. This continuous fuze setting also meant that these ships could fire a 'rolling barrage' pattern that followed the aircraft target as it moved through the sky, unlike the 'once and done' barrage pattern of the HACS Mark IV with ABU. According to Dr. Norman Friedman in 'US Naval Weapons,' although not clearly stated in BuOrd documents, the critical development leading to the Mark 37 appears to have been the development of reliable automatic transmission of data to and from the remotely mounted elements of the system. Dr. Friedman further states that BuOrd documents do claim that the Mark 37 was the first director intended from the beginning to use radar, for which its clear, flat roof was specifically designed.24 Another important development was that of RPC ("auto-control") equipment for the 5-inch gun mounts. RPC allowed the guns to automatically follow the bearing and elevation directions from the GFCS even as the ship pitched, yawed and rolled, rather than having the gun crew manually "follow the pointer" as was used on earlier systems. Unlike the HACS, the Mark 37 was a three-axis stabilized system that worked to a large degree with calculated data based upon active measurements, not the guesswork that made up such a large part of the HACS. This "tachymetric" design gave the Mark 37 an inherent advantage over the HACS in terms of combating dive-bombers and torpedo planes, the most likely - and dangerous - types of aircraft attack encountered during Second World War. The 1941 version of the Mark 37 could handle aircraft speeds up to 400 knots level and 250 knots vertical, which was adequate for World War II attack aircraft except for the late-war Ohka (Baka) kamikaze rocket-plane. It did prove to be inadequate against kamikazes, especially when they were performing acrobatics. However, the use of the integral slew-sight and the introduction of proximity-fuzed (VT) ammunition improved its performance against even this kind of attack. The Mark 37 GFCS was introduced to the Royal Navy when the old cruiser HMS Delhi was rearmed at New York Navy Yard in late 1941 with five 5-inch/38 Mark 12 guns and two Mark 37 GFCS. The combination of the predictive-based Mark 37 GFCS and rapid-firing 5-inch guns greatly impressed Royal Navy observers, and the British Admiralty placed orders for 82 more Mark 37 systems. Unfortunately, the rapid expansion of the US Navy during 1942-1944 precluded any additional diversions to the Royal Navy and no further British ships were equipped with them during the war. Following the end of the war, the battleship Vanguard, the carriers Eagle and Ark Royal and the last eight "Battle" class destroyers were completed with Mark 37 GFCS. These units had modified analog computers in order to accommodate the differences between US and British weapons. These post-war units were fitted with British Type 275 radar systems and were significantly heavier than the HACS, with the Mark 37 on HMS Vanguard weighing some 16.5 tons compared to about 12.5 tons for the HACS Mark VI used on HMS Anson. ^This thinking was not as wrong-headed as it may appear with twenty-twenty hindsight. To put this in the proper perspective of the time; since 1924 the USN had been developing dive bombing as a means of supporting Marine landing operations. This was mainly performed by fighter planes carrying only small bombs, which was correctly seen by the RAF as not being much of a threat to a warship. However, in 1930, the USN tested dive bombers which were capable of carrying a 1,000 lb. (454 kg) bomb, large enough to sink a destroyer and badly damage larger ships. In May of 1931, the USN started purchasing quantities of the Martin BM-series of dive bombers which could carry a 1,000 lb. (454 kg) bomb for about 400 nautical miles. A total of 32 of these planes had been delivered for service use by June 1933. This was enough planes to equip a squadron, Bombing One (VB-1), which was assigned to USS Lexington (CV-2). Not long after this time the German Luftwaffe recognized the potential of dive bombers and started large-scale procurement of these planes. The Japanese followed, beginning development of what would become their highly effective Aichi D3A "Val" dive bomber in 1936. So, although the RAF was partially correct in its 1931 assessment of dive bombers, it badly misread their future employment. ^This was at a time when the United States was designing their new destroyers with DP armament having a maximum elevation of 85 degrees and the Japanese were designing their destroyers with DP armament having a maximum elevation of 75 degrees. ^"Tachymetric" literally means measurement, but in this case what is meant is that the control system makes a series of measurements from which a true line of flight can be calculated. With this in hand, measured angular deviations from that line of flight can then be used to calculate a future position of the aircraft. Although this may sound simple in theory, for an anti-aircraft system it means that an optical rangefinder system must be stabilized, as any roll or pitch of the ship will destroy the accuracy of the measured angle. Next, the data must be quickly and reliably transmitted to an analog computer ('Table,' in British terms) which must work rapidly to solve the future position equation. Next, the calculated output data, in terms of gun elevation, bearing and fuze setting, must be accurately and swiftly transmitted to the guns, which must in turn be capable of promptly aligning themselves per the transmitted information and setting the shell time fuzes. In more modern terms, the HACS did not employ reliable stabilization, Remote Power Control (RPC) nor automatic data transmission, but instead substituted guesswork and manual overrides in an unsuccessful effort to achieve the same ends. ^Hamer, 1998, p. 44-45, Brown, 2000, p. 209. In what is perhaps the best-known example of the state of Britain's pre-war anti-aircraft capability, in a 1937 firing exercise, a radio-controlled Queen Bee drone, a converted Tiger Moth, was able to fly straight and level at 85 knots around the entire Mediterranean Fleet for over an hour without being hit by a single shell. Brown, 2000, p. 209. Hamer, p. 346, quoted from Ranft, Brian (ed) 1977, p. 116, Technical Change and British Naval Policy 1860-1939 (Hodder & Stoughton, London, 1977). Adm. Henderson's views received some pre-war validation in January 1939 when the Admiralty Sub-Committee on Bombing and A-A Gunfire Experiments estimated that for each aircraft shot down by ships' gunfire, one hit would be scored on a cruiser or two on a carrier. The Sub-Committee further stated that destroyers were virtually defenceless against air attack. Hamer, p. 346, using material from Roskill, Stephen, p. 420, Naval Policy between the Wars: Volume 2: The Period of Reluctant Rearmament, 1930-1939 (Collins, London, 1976). ^Raven and Roberts, 1976, p. 160. These low ammunition expenditure figures show the high peace-time esteem in which HACS was held. War-time experience was vastly different. An analysis of the anti-aircraft actions during the first years of the war showed that 2,000 to 10,000 rounds per plane (depending upon range) were more realistic figures. Pout, 1995, p. 94. ^Raven and Roberts, 1976, p. 378-379, Campbell, 1985, p. 17. ^The British claimed eight Ju-87s downed during the attacks on Illustrious and Valiant, three by anti-aircraft fire and five by the Fulmar air cover. However, German reports show that about 32 Ju-87s from I and II/St.G2 participated in the action, of which only three were lost during the attacks plus another one which was heavily damaged by a British fighter and written off following a crash landing back at its base. Malta, 1987, p. 115. ^Later in the war, with the greater availability and use of such short and mid-range weapons as the 20 mm Oerlikon and 40 mm Bofors automatic weapons, some destroyers had their 3 and 4-inch AA guns removed and their torpedo tubes reinstalled. Destroyers built late in the war were equipped with 4.5-inch and 4.7-inch main guns whose elevation had been increased to 55 degrees, but this was still considered to be inadequate against aircraft such as dive-bombers. The 4.5-inch guns on the "Battle" class destroyers had a maximum elevation of 80 degrees, but only one of these ships was completed in time to be sent to the Far East Fleet and she arrived too late to participate in any of the final battles of the war. ^For example, during the destruction of Force Z, both HMS Prince of Wales and HMS Repulse apparently failed to shoot down a single plane with their HACS-controlled guns. Interestingly, the first attack was by eight high-level bombers, the very threat that HACS had been designed to combat. Partly due to poor fleet handling by Adm. Phillips, it took a long time for the British ships to get the range on the Japanese aircraft, which allowed the Japanese pilots to conduct their approach practically unopposed. During this particular attack, a total of 108 rounds were fired by the 5.25-inch guns on HMS Prince of Wales and a further thirty-six rounds were fired by the 4-inch guns on HMS Repulse. Five aircraft were damaged, two seriously enough that they were forced to return to base without dropping their second bomb. In return, the Japanese were able to score one hit on HMS Repulse with a 250 kg HE bomb. Of the three Japanese torpedo bombers that were actually shot down during the rest of the battle, one was most likely hit by HMS Prince of Wales' 20 mm Oerlikons and the other two were downed by HMS Repulse's 2-pdr. pom-poms. However, all three planes had already launched their torpedoes at the ships. Middlebrook and Mahoney, 1977, p. 143-144, 182. ^The 'angle of presentation' is the angle that the fuselage of the target aircraft makes in relationship to the vertical as seen by the control officer with his binocular sights. This was measured by the control officer by aligning an arrow in his sights with the aircraft's fuselage. This measurement was not a direct indication of the target's course, but could be used by the HACS Table along with other data to calculate it. ^Campbell, 1985, p. 18. This paragraph shows some of the fundamental limitations of the HACS and how 'guesswork' was substituted for measured data. For example, true wind speed and direction can be accurately calculated by a simple trigonometric formula using the ship's speed and course along with the apparent wind speed and direction - and instrumentation to perform such calculations automatically was readily available - yet the British designers opted instead to add yet another burden to the HACS control officer's workload, as if he had little else to do but to play guessing games while trying to keep his sights aligned on the approaching attacker. ^Campbell, 1985, p. 17, Pout, p. 141-143. ^Raven and Roberts, 1976, p. 160. ^Data in this section primarily from Campbell, 1985, p. 18-19 and Pout, 1995, p. 99-101. ^SpecORG1, 1945, p. 8 and SpecORG2, 1945, p. 7. Hodges, Peter and Friedman, Norman, Destroyer Weapons of World War 2 (Conway Maritime Press, LTD, London, 1979). Referenced as 'Hodges' in footnotes. Pout, H.W., 'Weapon Direction in the Royal Navy' in Kingsley, F.A., The Development of Radar Equipments for the Royal Navy, 1935-45 (The Macmillan Press LTD, 1995). Referenced as 'Pout' in footnotes. Shores, Christopher; Cull, Brian; Malizia, Nicola, Malta: The Hurricane Years, 1940-41 (Squadron Signal Publications, Carrollton, 1987). Referenced as 'Malta' in footnotes. Special Defense Operations Research Group (SpecORG) paper, AA Defense of the Fast Carrier Task Force - 24 October 1944 To 21 March 1945. Referenced as 'SpecORG1' in footnotes. Special Defense Operations Research Group (SpecORG) paper, Anti-Aircraft Study No. 8, revised 11 September 1945. Referenced as 'SpecORG2' in footnotes. Data on Martin BM dive bombers from Glenn L. Martin Aviation Museum. Accessed on 18 March 2000. A.E. Jacobs, The Loss of Repulse and Prince of Wales: A Participant's Account. Warship International No. 1, 1986. Transcribed and web-published at NavWeaps. Special thanks to Dave Alton, William D. O'Neil and Richard Worth. Corrected entry date of Mark 37 GFCS, added note concerning RPC on gunmounts, added Aichi D3A "Val" note.